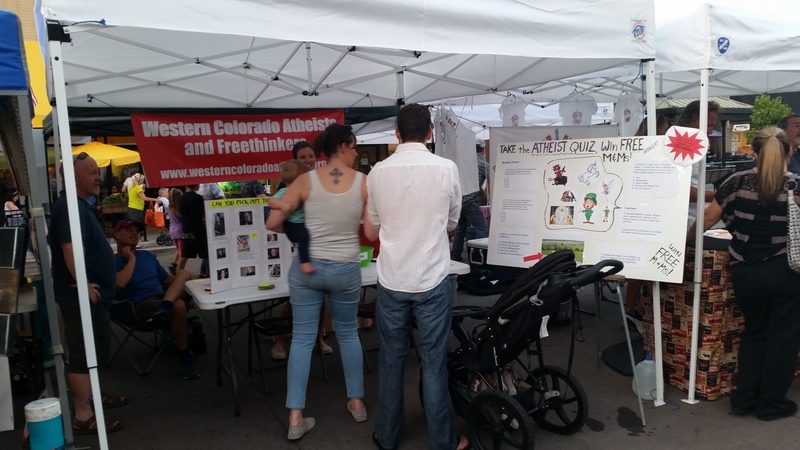 Western Colorado Atheists and Freethinkers (WCAF) again hosted their highly popular booth at the Main Street Farmers Market in downtown Grand Junction on Thursday, 9/24. 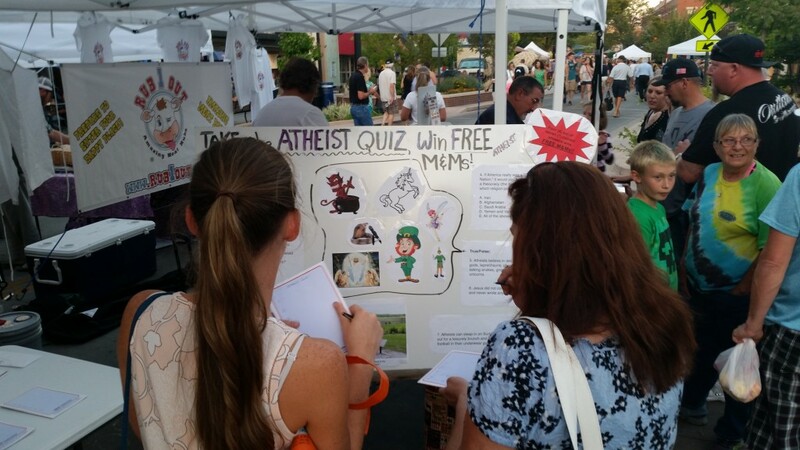 So far, WCAF’s has been the only booth at the Farmers Market to challenge people’s knowledge and sense of fun by offering a short and always-entertaining Atheist Quiz. People seem to love it, too. Of course, it’s completely true! The booth always captures plenty of attention, hosts lots of engaging conversation, makes WCAF a load of new friends, brings in new members and enlightens locals about Grand Junction’s growing secular community. WCAF was founded in February, 2007, to provide fellowship for area residents who don’t believe in gods, devils, angels, unicorns, leprechauns, elves or other mythical beings. WCAF also advocates the the separation of church and state on the Western Slope, keeping an eye on local institutions that occasionally have mingled religion and government inappropriately, like District 51 schools, City Council and the County Commission. Secularism continues to grow on the western slope. WCAF started a new branch in Montrose over the last year called Montrose HAFTA (Humanists, Atheists, Freethinkers and Agnostics). HAFTA has seen spectacular growth sometimes having up to a 9-10 new members at their meetings. In Grand Junction, WCAF in Grand Junction meets on the first Sunday of every month at 3:00 p.m. at the Trailhead Coffee House, 413 Monument Road. Meetings are free and open to the public, and everyone is welcome.